On their third outing, Danish quartet, Traeben, continue with a free roaming blues and groove laden formula that made their second album Push one of my favourites in 2011. Looking At The Strom sees the quartet growing further and stronger with each number. It's a well rounded continuation of the solid compositions on Push. Opening with what felt like a fun spy-jazz themed theme, "Do You Think They're Any Good," showcases the groups depth and agility to move from fun and rugged to adventurous with ease. Ballegaard and Larsen ride swiftly here with some sharp and bold tones keep the listener focused and intrigued throughout. "Better Than The Other One" kicks things into a different gear and feels more like a rock group moving with heavy patches of guitar and pounding bass and drums. Ballegaard's sax provides a little respite but cuts tightly against the aggression of the rest of the band. This is a band really stretching out to be more than just another European jazz ensemble. The title track seems to be perfect way to end the album. It takes a clam relaxed tone and slowly builds to cascade of crashing symbols, lush sax melodies and harmonic guitar lines. Bluesy, bold and beautiful. 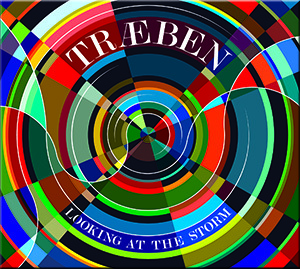 Looking At The Storm is an effort that takes chances and sees Traeben growing as band and composers. Their ability to move forward with some really creative pieces makes Looking At The Storm an exciting musical experience and worth every listen. Over and over. Definitely a record not be missed out on this year.